BAKU - Turkey fully intends to proceed with the Trans Anatolian Natural Gas Pipeline and the Southern Gas Corridor projects, Energy Minister Taner Yildiz said on Thursday. 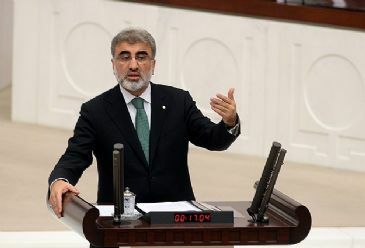 "These projects take advantage of Turkey's geographic position, and Turkey will use that advantage in favor of its neighbors and EU members," Turkey's Minister of Energy and Natural Resources Taner Yildiz said. Speaking at the Consultative Council on the Southern Gas Corridor project in Baku, Azerbaijan, Yildiz said that his country is determined both politically and economically about the project. "The $45 billion Southern Gas Corridor is one of the most significant projects for the supply of natural gas to European Union countries," said Yildiz. The 3,500 kilometer-long Southern Gas Corridor is planned to carry natural gas beginning at Azerbaijan on the east near the Caspian Sea, then passing through Turkish territory to reach Greece in the west, and then further on to Albania and Italy. The 2,000 kilometer-long $11 billion TANAP project will be a critical part of the corridor, as it will transport natural gas from Azerbaijan's Shah Deniz 2 field on the Caspian Sea. "TANAP is moving ahead of schedule," Yildiz said, adding that Turkey has increased its share of the Shah Deniz 2 natural gas field. The pipeline will originate at the Georgia-Turkey border, then pass through Anatolia to reach Greece to carry 16 billion cubic meters of gas annually when it is completed in 2018. Six billion cubic meters of gas will be for Turkey's domestic consumption. TANAP has a potential capacity for upgrade, which is planned to reach 31 billion cubic meters by 2026. "All rings of the chain must be linked together," explained Yildiz, stressing that each country of the Southern Gas Corridor has to contribute to the project. Yildiz said that the Turkish President will attend the groundbreaking ceremony of TANAP in March. The Energy Minister has also met in Baku with the current Vice President of the European Commission in charge of Energy Union Maros Sefcovic, and Minister of Industry and Energy of Azerbaijan Natiq Aliyev. Yildiz also met with Amos Hochstein, the special envoy and coordinator for International Energy Affairs leading the Bureau of Energy Resources at the U.S. Department of State, and the Minister of Productive Reconstruction, Environment and Energy of Greece Panagiotis Lafazanis.